Sen. Chris Murphy outlines his pitch to the president. “That is potentially music to the ears of thousands of Connecticut businesses that want more contracts with the federal government,” U.S. Sen. Chris Murphy, D-Conn., said Monday in the last of three Trump-related press conferences that started within 45 minutes of each other at the Legislative Office Building in Hartford. While some of Murphy’s political allies denounced a Trump cabinet nominee in one news conference and others held a second to maintain the momentum of the mass protests led by women’s groups over the weekend, Murphy reversed field and outlined his first effort at constructive engagement with the new GOP administration. 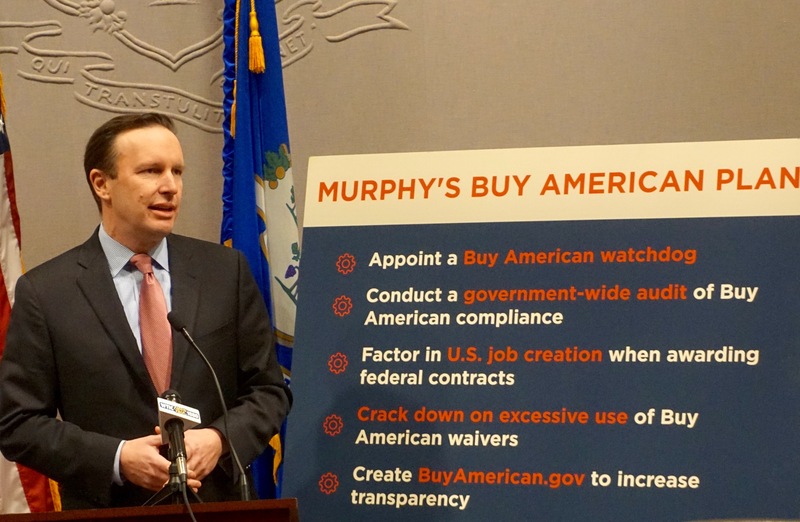 Murphy sent a letter to Trump, suggesting executive actions leading to more purchases from U.S. companies, including creation of a government web site listing all waivers from Buy American laws. He also is seeking a meeting with the president or his trade advisers so he can pitch his ideas, creating the possibility of an awkward photo op. 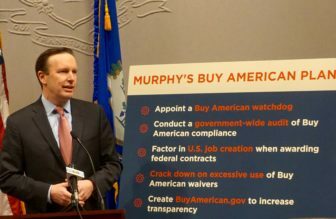 As a member of the U.S. House and then as a senator, Murphy has tried since 2008 to pressure the government, particularly the buying machine that is the Pentagon, to break its habit of routinely waiving rules for buying from U.S. manufacturers. He had little luck with the Obama administration. Earlier Monday, Murphy said he was visiting Platt Brothers & Co., a century-old manufacturer in Waterbury, when it was notified by the U.S. Army that it has shifted purchasing of material once supplied by Platt to a European company under provisions of a NATO treaty. The decision costs the company $100,000, Murphy said. “So this isn’t theoretical,” he said. Murphy was elected to the Senate in 2012, succeeding Joseph I. Lieberman and defeating Linda McMahon, the president’s nominee for the cabinet-rank post overseeing the Small Business Administration. In the early days of a 2018 re-election campaign, Murphy can expect that his dealing with Trump will be closely watched. He said he expects criticism from erstwhile allies for the outreach, given that some have warned Democrats not to “normalize” Trump by doing business with him. Lori J. Pelletier, the president of the Connecticut AFL-CIO and one of the 10,000 marchers who gathered Saturday outside the State Capitol in solidarity with the Women’s March on Washington, said she had no objection to Murphy’s overture to Trump. U.S. Sen. Richard Blumenthal, also a Democrat, held a sparsely attended press conference at 10:45 a.m. with environmentalists opposed to the nomination of Scott Pruitt as the administrator of the Environmental Protection Agency. Pruitt repeatedly filed lawsuits to block enforcement actions by the Environmental Protection Agency as the attorney general of Oklahoma. Blumenthal and Murphy have previously shared their concerns about Pruitt. At 11 a.m., about two-dozen state legislators and Comptroller Kevin P. Lembo, a potential candidate for governor in 2018, gathered to show support for women’s reproductive and other health-care rights. It drew far more media attention that Blumenthal’s news conference or Murphy’s at 11:30 a.m. In fact, Blumenthal joined the women’s press conference in progress. 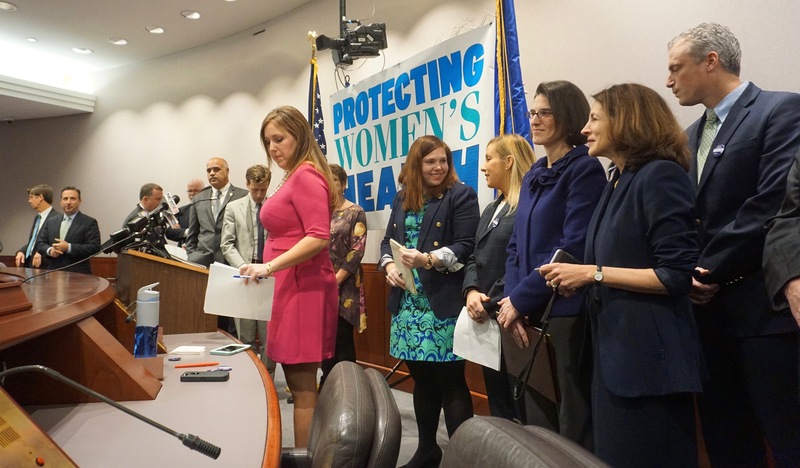 Sen. Mae Flexer, D-Killingly, who organized the press conference, acknowledged that abortion rights were under no real political threat in Connecticut, where reproductive health traditionally has won strong bipartisan support. Two Republican representatives, Noreen Kokoruda of Madison and Gail Lavielle of Wilton, stood with the Democrats. State Sen Mae Flexer, center, organized a follow up to the Women\’s March.